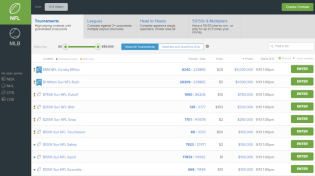 FanDuel is the largest daily fantasy sports (“DFS” for short) sites in the world. They were one of the pioneers in the industry, first coming onto the scene in 2009, before becoming the global giant you see before you today. You have undoubtedly seen their aggressive marketing campaigns all over ESPN, Fox Sports and numerous other cable network outlets, which have amounted in tens of millions alone in ad spends – especially around NFL season. As of right now, they are still the “gold standard” of DFS sites as it stands right now. And while there have been a few courtroom battles as of late regarding the legality of daily fantasy games, FanDuel has continued to be a driving force behind the lobbying efforts for DFS games to be 100% allowed in all state jurisdictions. As it stands, they are legal in most of the United States and is it unknown whether they will begin taking some of their operation overseas. FanDuel paid out over a billion dollars in prizes in 2015, a number that is certainly showing no signs of slowing down going forward into the future. 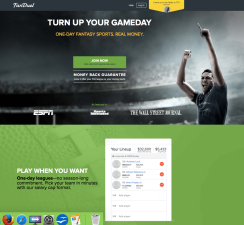 With a loyal following of over 600,000 users and a variety of different game types they offer to their players, it’s hard to see FanDuel failing at what they do best – DAILY FANTASY SPORTS. We’ll take a look at all the positives – and even negatives – of the site in this review. So read on for more information. #1 Daily Fantasy site in the industry. $200 bonus that NEVER expires. Huge GPP's with prizes exceeding $100K. Bonus clearance rate is lackluster and slow. Rewards program could use revamping. Lack of sports offered compared to other competitors, especially DraftKings. New players signing up to FanDuel will receive a bonus of 100% up to $200 on their first deposit. This deposit bonus will show as “Pending” when you login to your account, but it tracks your progress as you play in more games automatically. The bonus is lackluster compared to many of its DFS counterparts, but it never expires so you’ll be be able to take full advantage of it for the life of your account’s initial deposit. The bonus releases at a 4% of whatever entry fee you pay per game on the site, until the full amount up to $200 is matched and deposited back into your account. Essentially, if you’re entering contests that rack up $100 in buy-in fees, expect to see $4 credited to your account immediately (on top of any winnings from your games of course). You will also earn FanDuel points (FDP’s) to use towards free entries into other tournaments. Their free play system is similar to DraftKings, which is tiered depending on the volume you put in for the DFS contests you play. It keeps DFS pros on their feet and gives new players incentive to learn DFS and play more games and gain even more points along the way. The software set up by the brainiacs at FanDuel is one of the most sophisticated and easily accessible platforms I’ve ever had the pleasure of playing on today. All of your player stats and real-time game information is available right away and I’ve never experienced any lag on the site, unless of course my internet was down. 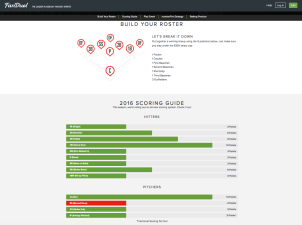 Players can use simple dropdown menus to navigate not just around the site, but also to check out all your lineups and game statuses. Your account dashboard is accessible by logging into the top right of the website or straight from the mobile app they offer. Whether you’re playing a head-to-head match or a big buy-in tournament, you’ll always be able to see all of those games as they happen and with real-time scoring. 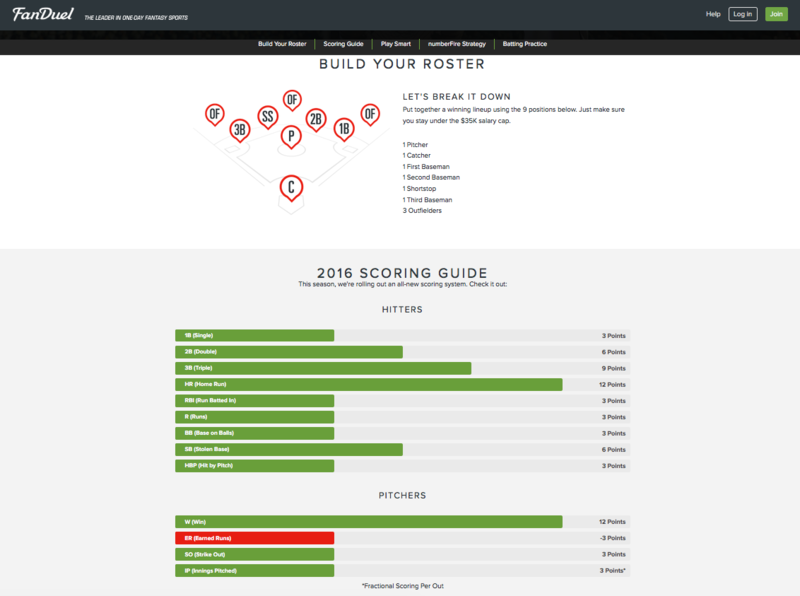 The functionality on this site is no joke and I highly recommend it as one of the first DFS sites you check out solely because of the intuitive software they offer. The best and easiest way to access your account from your smartphone or tablet is by downloading their standalone app straight from the Apple Store or Android Marketplace. The app is comparable to ESPN, Yahoo and CBS Fantasy app’s that have been out slightly longer than FanDuel’s. However, it may be significantly better than those in the sense that FD’s app doesn’t seem to crash as much as other similar downloadable app’s. The FanDuel app makes accessing your account and setting your lineups simply and effectively. You can also load your account with more cash if need be, make withdrawal requests and of course check existing lineups and statuses of your other matchups and tournaments with the tap of your finger. It is easily one of the most downloaded apps in the sports market today and is continually being updated by FD developers to ensure quality. Daily fantasy is really simplistic in nature. The founders of the company did their homework and marketed the company with the intent to feature games sports fans really loved and that didn’t require them to do countless hours of research studying players, teams and other miscellaneous conditions. This is why the main games offered at FanDuel revolve around the oft-mentioned “Big 4” sports leagues – NFL, NBA, MLB and NHL. It is unclear whether FanDuel will offer more sports down the road, but I would imagine if they add anything to the slate it would involve PGA Golf and international soccer. The latter seems inevitable as DraftKings announced it would be opening up shop in England and implement soccer DFS games to its lineup. You can find a multitude of contests available for play for each of these major sporting leagues, which include 50/50’s, head-to-head matches and huge tournaments that feature thousands of lineup entries. For good measure, they also offer step tournaments, survivor events and H2H Matrix tournaments to mix up the competition amongst its player base. As mentioned above, there are a lot of different games in play when you start loading lineups at FanDuel, with games like head-to-head, 50/50’s and tournaments being the most popular. Here is a brief explanation of how each of those work so you get a better understanding of what to expect once you start playing for real money DFS at FanDuel. Head-to-Head Games – As the name suggests, in this game you will only be up against one other person and their lineup. Simple as that. Instead of tournaments, where you will be up against thousands of potential lineups, head-to-head’s are a safer bet, especially if you’re a new player. You can invite friends or create your own contests, with FanDuel providing you an automatic opponent come game time – and if your H2H doesn’t fill, they’ll refund your entry instantly. 50/50’s – These games will pay out the TOP half of the contestants who enter the competition. You set your lineup as usual, and if your team ends up in the top half of scoring for the player pool you will be rewarded an EQUAL portion of the prize pool. In essence, if the prize pool is $5,000 and has 90 entrants, the top 45 scoring teams will earn an equal prize of $111.11 per user. 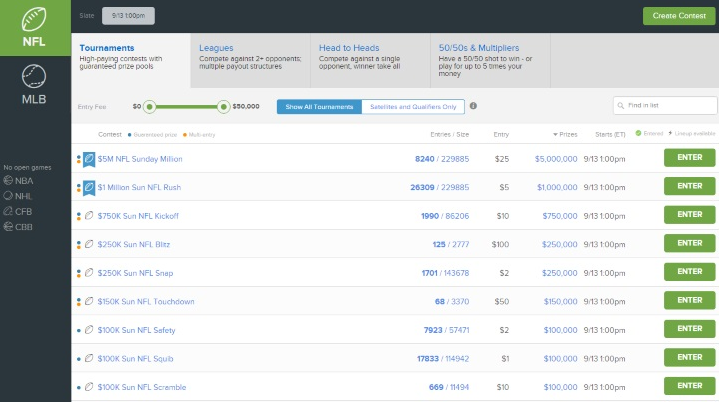 Tournaments – FanDuel tournaments offers huge prizes for those looking to show off their DFS knowledge and skills. These are labeled with a blue “G” symbol in the lobby (or just say “Guaranteed” next to them) and are of course the most juicy type of game you can enter as a DFS player. Some of these tournaments have thousands of lineups being entered by tons of players around the world, so while it’s ok to go for broke with just 1 lineup, most of the big winners diversify and mix up their lineups and submit multiple rosters to spread out risk and reward. Since daily fantasy sports are legal in the United States and abroad, there aren’t the usual bumps in the road when it comes to collecting your winnings or depositing funds to your account. FanDuel offers some nice deposit options for players looking to crack into DFS. If for whatever reason you run into any problems with funding your account or withdrawing, you can contact support at (917) 525-4538 or via email by clicking this link: https://www.fanduel.com/p/SupportTicket. Deposits normally take just seconds to be approved and credited. 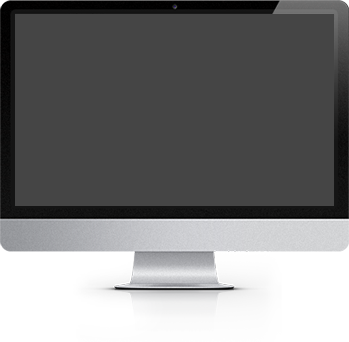 From there, you’ll be able to start checking out the site and setting your first lineups. There also ZERO fees involved when it comes to funding your account. Like depositing, withdrawals from your FanDuel account are credited back almost instantly. If you used a credit or debit card you will normally see that cash posted back to your account right away. Check withdrawals are available too, but those normally take 7 to 10 business days to get to your doorstop. PayPal users will see their withdrawals posted to their account within 24 to 48 hours. PayPal is the most widely used deposit and withdrawal option at FanDuel, so rest assured you know FD works tirelessly to get them sent out as quickly as possible. There are also ZERO fees when you want to make a withdrawal on your account. As of April 2016, there are a few states that have voted against allowing daily fantasy sites like FanDuel to operate. While games are technically 100% legal according to federal laws, individual states have been allowed to rule on the legality within their own state’s borders and lawmakers in these jurisdictions have essentially banned DFS companies like DraftKings and FanDuel from offering real money DFS games. We will continually update this section as needed if these states overturn their DFS regulations or if any other states decide to ban FanDuel in their locale.